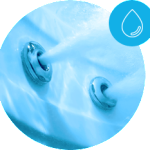 Certain spa manufacturers promote the use of di-chlor granular in their spas, however we at AquaFinesse feel that the best system to use with our product is the dispenser containing tri-chlor as it releases slowly over the week producing constant low levels of chlorine disinfection over the filter (The vacuum cleaner of your spa) where bacteria and debris (nutrients for bacteria) gather. We find that this system works best as it is self dosing and not so dependent on the owner who may forget to sanitise from time to time. If however the spa manufacturer insists on Di-Chlor due to warrantee, please abide by manufacturers guidelines. 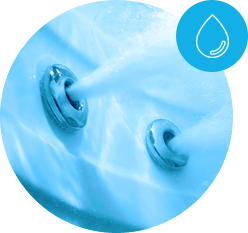 To respect the warrantee of certain manufacturers we recommend the following Spa brands use Di-chlor ( granular ) instead of Tri-chLor: 4 seasons spas, Hot spring , Caldera, Solana, Hotspot, and Dimension one. The AquaFinesse box contains Tri-chlor tablets as standard, but if you or your manufacture would prefer you may safely use Di-chlor (granules) as an alternative. Please ask your AquaFinesse supplier.